Searching for classic New England? 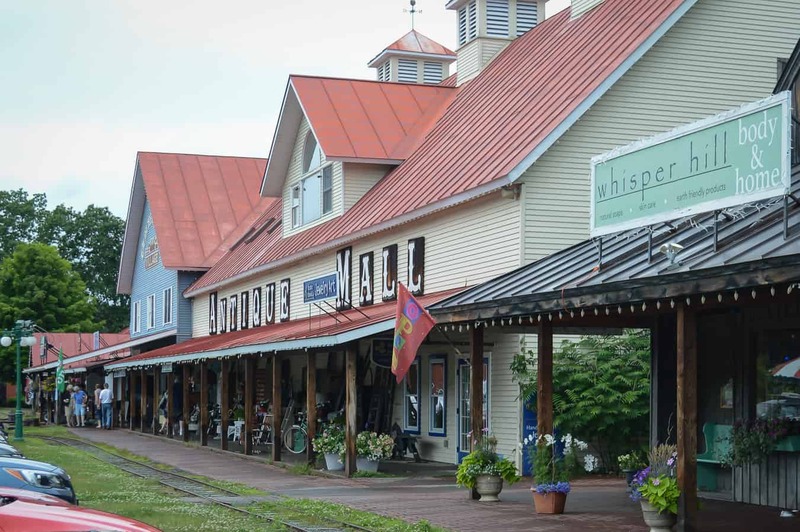 Our list of things to do in Woodstock VT will help you find it. Cozy towns, maple syrup, autumn leaves. 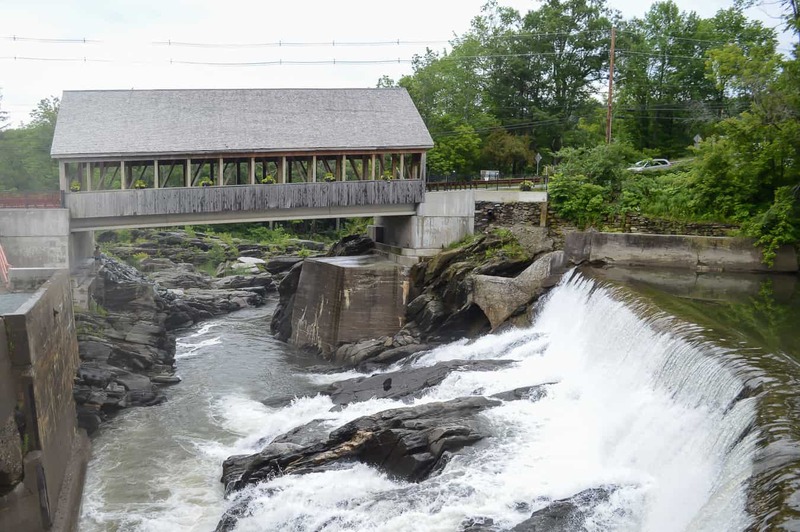 When you think of Vermont, foliage and covered bridges often come to mind. Or, you may envision a wintry snow-globe village, where wreaths decorate each welcoming door, and horse-drawn sleighs ferry smiling passengers down the lane. That Norman Rockwell-esque scene you might be picturing is surprisingly true to life. Here in Woodstock, you’ll encounter one of the prettiest places in Vermont, one of the best places to spend Christmas, and one of the most beautiful towns in America. Here’s a perfect itinerary to keep you busy in this idyllic town. No Vermont vacation is complete without cheese. In the past, it was said that Vermont’s population had more cows than people! Not hard to imagine, with farmland stretching for miles across the state. Either way, those cows are producing some great dairy, and Vermont’s cheesemakers are turning it into the finest cheese. Cabot is the most famous cheese purveyor, available in stores throughout the US. You can’t go wrong with a nice block of Cabot sharp cheddar. But when in Vermont, you want to try ALL THE CHEESES. You can have a wonderful cheese feast at Quechee Gorge Village. As you walk through the cute shops in the village, you’ll find the big spread of cheese samples, along with crackers and some jams, too. Give all the varieties a taste and buy a block to take home. With the abundance of cheese to sample, you may find it hard not to get greedy! Cabot is not the only cheese in Vermont, not by a mile. 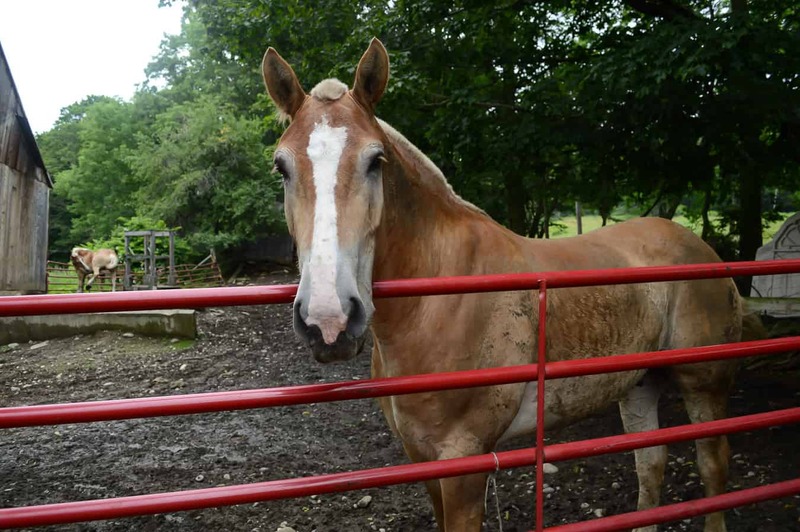 A visit to Woodstock VT demands a visit to a local Woodstock farm. Head up to Sugarbush Farm, tucked away in the hills, for more cheese sampling as well as maple syrup tasting. 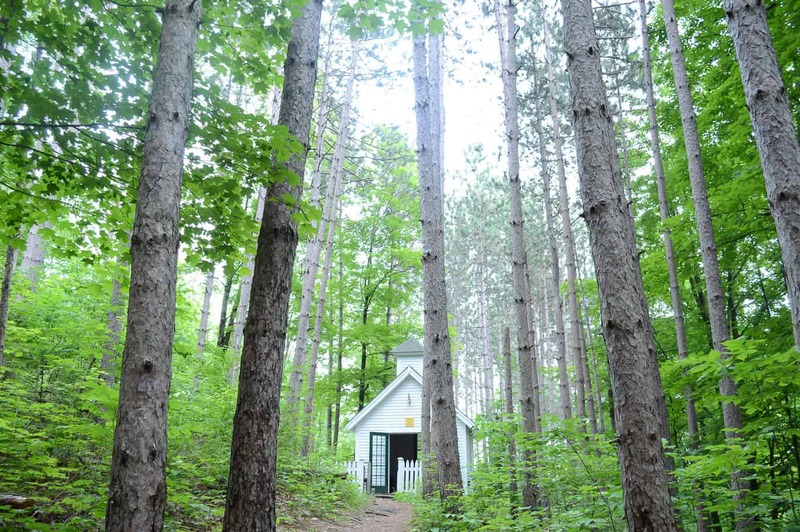 While you’re there, you can also walk around the farm and learn about how maple syrup is made. This place is a family farm with land dating back generations. Vermont: home of maple syrup! 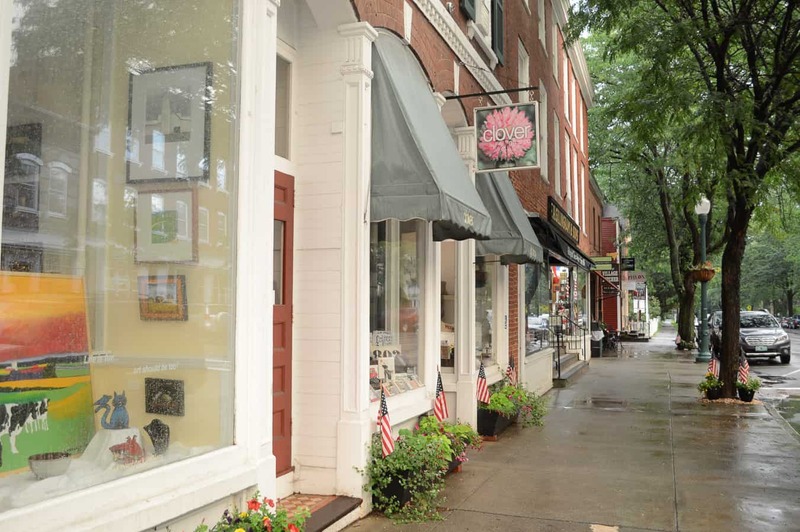 Downtown Woodstock VT is a fabulous place for shopping, dining, and simply walking. This cute area can get crowded on weekends or during busy events, and it’s no wonder—there’s lots to see and do. 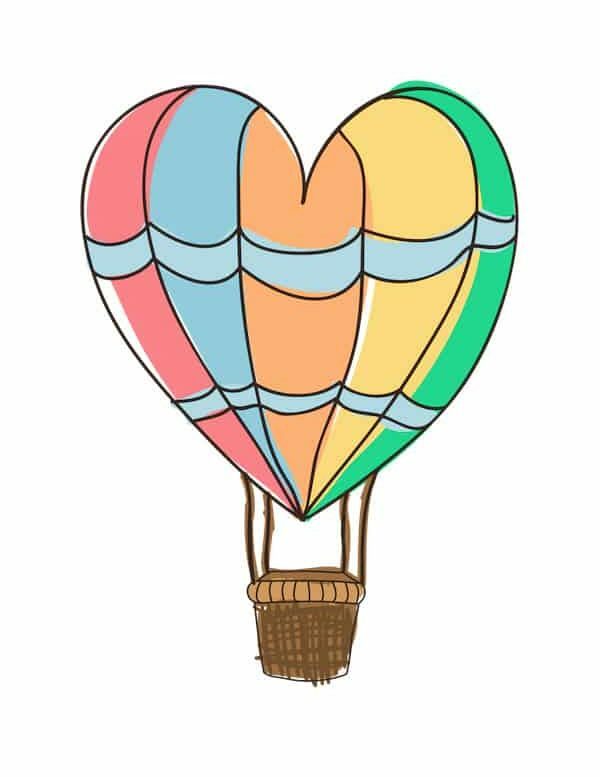 There are bookstores, toy shops, stores selling apparel, and plenty of options for gifts, arts, and crafts. 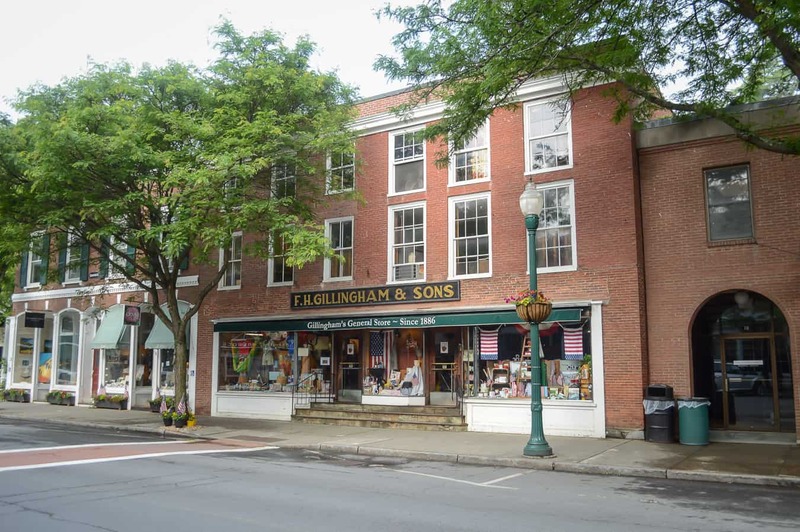 Don’t miss FH Gillingham & Sons, a classic Vermont general store in the heart of downtown. This 1886 shop is a Woodstock staple, and is renowned as one of VT’s oldest family-run general stores. 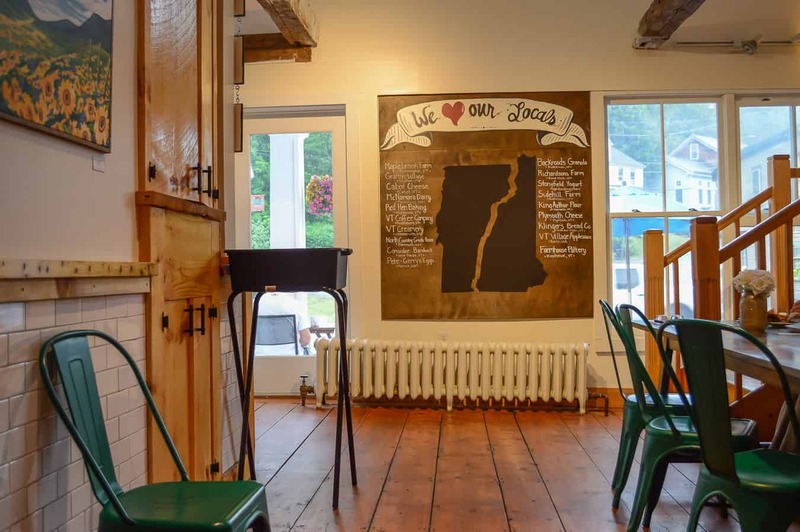 Stop here for all kinds of Vermont-made items, souvenirs, and a nice selection of wine. Vermont Flannel Company – stay cozy! Even if you’re not shopping, downtown Woodstock is a lovely place to walk around. 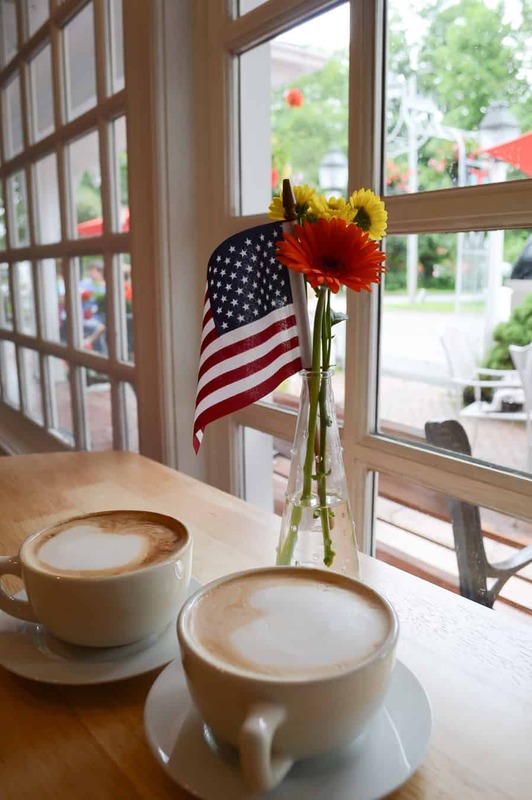 You can explore the covered bridge, admire the iconic Woodstock Inn, or simply sit with a coffee and people watch. You never know who you might meet. 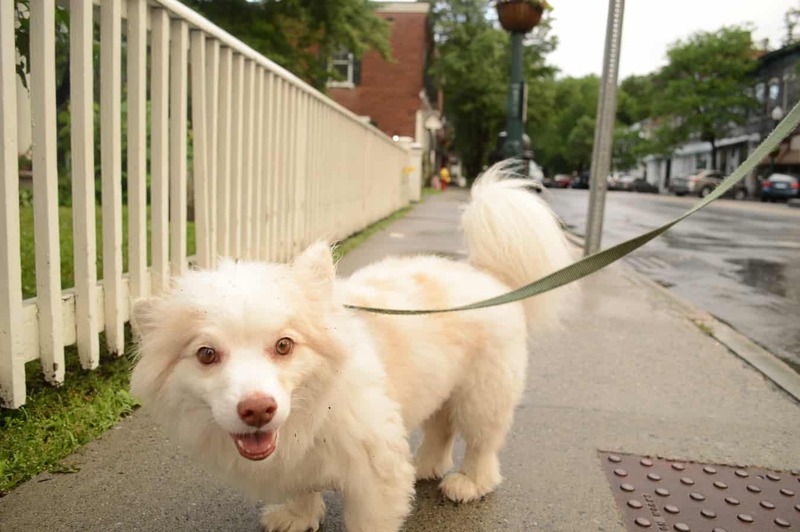 On our last trip to Woodstock, we got to meet this tiny polar bear! Oso – Cutest dog ever! Sampling Vermont beer is a must-do when traveling in Vermont. 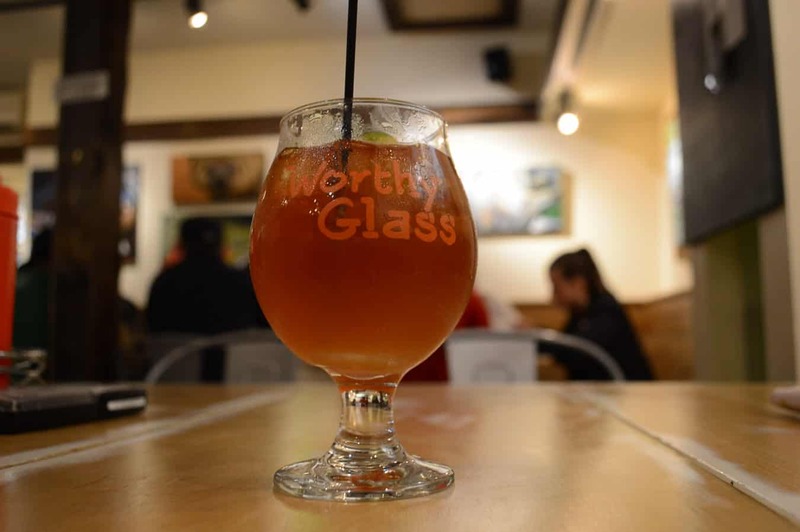 When in Woodstock, make the quick 15 minute drive west to the Long Trail Brewery, to try some of Vermont’s most well-known (and well-loved) beers. Take a brewery tour, then enjoy beer flights or snacks at their Bavarian-inspired pub. There are nice views and delicious brews–what more do you need? 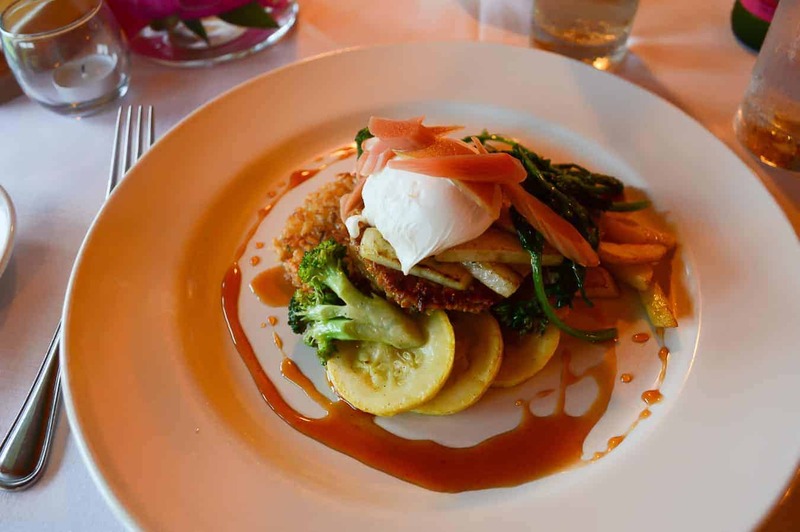 You can’t miss out on farm-to-table dining in VT. A state of farmland has inspired countless restaurants using crops, meat, and more, straight from the source. 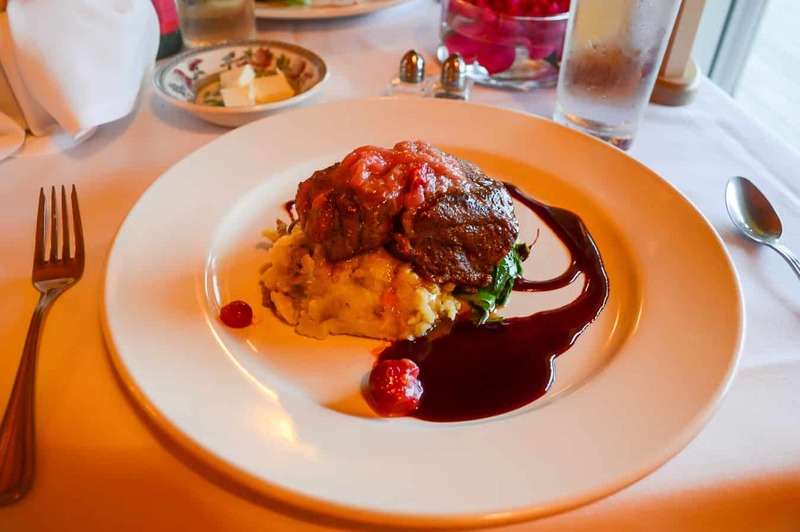 One Woodstock Vermont restaurant that should be on the top of your list is Cloudland Farm. This farm-to-table operation is absolutely divine. Cloudland Farm is found up a winding set of beautiful VT roads. You might feel as if you’ve taken a wrong turn, but you’re on the right track. Around a final bend you’ll see the sprawling property overlooking a stunning mountain vista. Then, it’s time for your dinner. Get ready for an incredible meal. Each night and each menu is different, with chef-selected daily fare crafted entirely from local ingredients. A list on your table will let you know where each item has been sourced. The number of Vermont, New Hampshire, and even Massachusetts farms that Cloudland partners with is impressive. The entree at Cloudland was braised pork (raised right at Cloudland itself), herb mashed potatoes, with a rhubarb compote and a berry glaze. Amy had a vegetarian option (risotto cakes) also with fresh rhubarb and a local egg. Both dishes were phenomenal, served with a fresh green salad to start, and finished off with strawberry crepes and basil ice cream. The entire experience was lovely and the food flavors brilliantly paired. The waitstaff is great and your dinner feels so personalized and special. We would highly recommend Cloudland for fine dining in Woodstock VT. If visiting Woodstock with kids, don’t miss Billings Farm. This is a working dairy farm that is all about demonstrations and education. An afternoon here can show you a great deal about the inner workings of a Vermont farm, and you can see the animals up close and personal. Billings Farm is a beautiful property and is definitely one of the top things to do around Woodstock VT.
New England is a great place to go antiquing. Both of us grew up in the south, and it surprises us how many antique shops there are all over Vermont and New Hampshire. Well, if you love searching for treasures of the past, we found the trove. In the Quechee Gorge Village (the same place you can sample Cabot cheese) is an enormous antiques mall. Several floors are filled with antique items of all kinds. It’s a fascinating spot to walk around in. Our recent trip to Woodstock left us with some bad weather – exploring this antiques mall was a perfect rainy day activity! After you’ve delved into antiques for an hour or so, head on down to the end of the shopping center and visit Vermont Spirits. 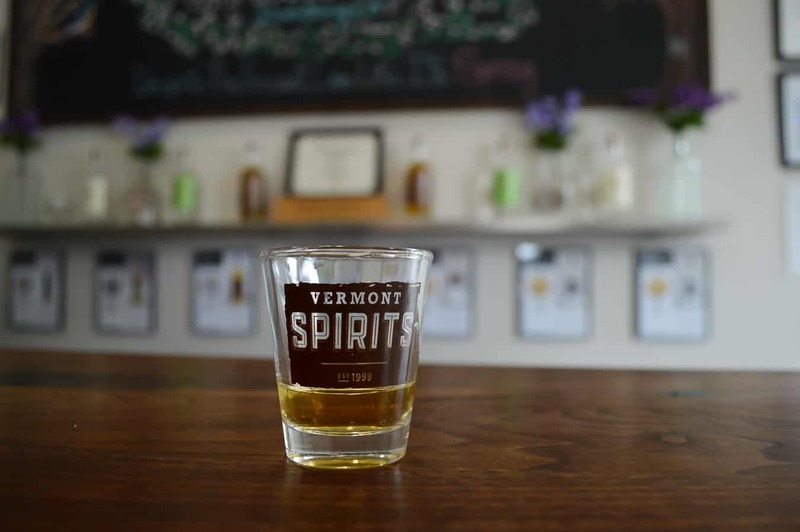 There you can sample some Vermont-made whisky, gin, bourbon, and more. A free tasting lets you try 4 different spirits. Get ready to feel the burn a bit, but they are delicious. We liked the 1791 Cocktail, which had a fruity touch. Woodstock and Quechee are different towns in west-central Vermont, but a trip to one can’t really be complete without a trip to the other. When you’re searching for things to do near Woodstock VT, also be looking for things to do in Quechee VT. There are so many! One of our very favorite sites in the region is Quechee Gorge. This awe-inspiring natural formation can be best seen from the bridge on Route 4. There is a parking area just beyond the bridge, and the bridge has a sidewalk with rails, so you can safely walk out and peer into the gorge. The gorge is especially magical in the autumn, when the trees on either side burst into remarkable hues of orange and red. If you’re feeling adventurous, you can do a fairly short hike down alongside the gorge. The trail leaves from around the parking area and takes you to some short waterfalls. 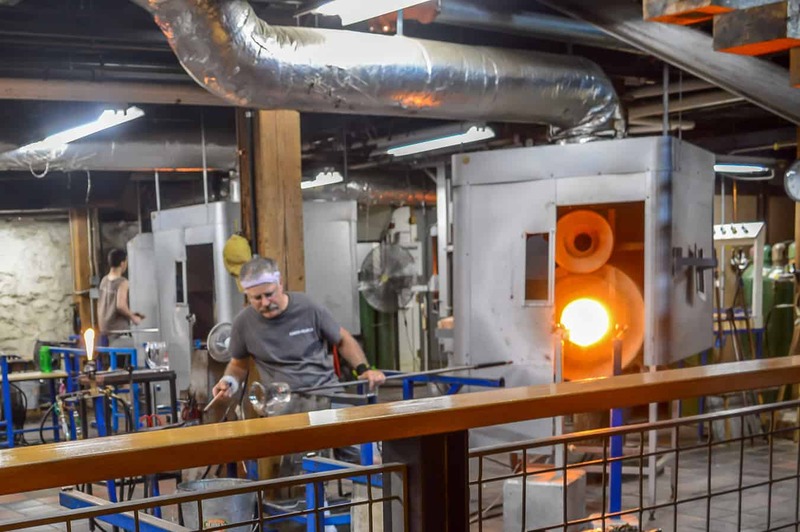 Glassblowing is a popular art in New England. There are many workshops that offer demonstrations, tours, and even lessons. A really nice place to see glass blowing in action is at Simon Pearce. This glassware shop is a whole complex, with an elegant shop, a glass blowing studio, and a bar and restaurant. Head downstairs first to see the glass blowing in action. Several artisans were at work at once on our Saturday afternoon visit. Though the room is hot and bright, these blowers seemed perfectly relaxed and happy, creating beautiful glass works with ease. Watching them is also hypnotic, but don’t be afraid to ask questions. The artisans are glad to chat with you and educate you on glass blowing. 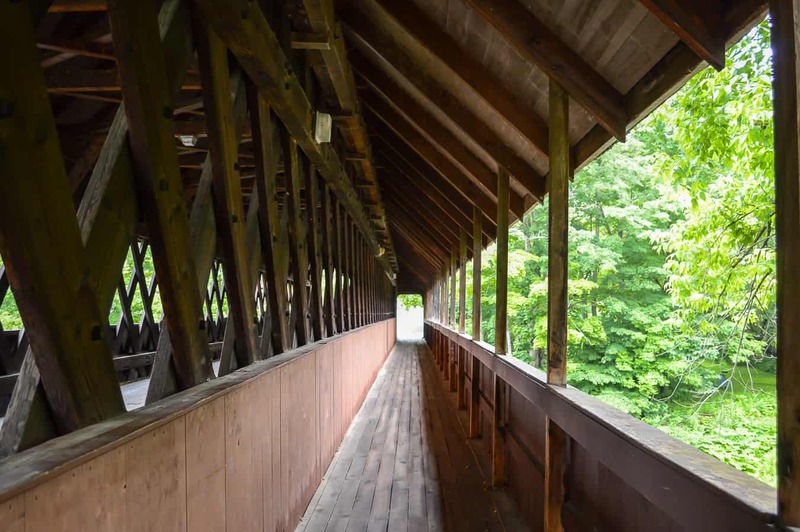 You can step through onto the balcony and enjoy the refreshing breeze off of the nearby covered bridge. Simon Pearce has a beautiful view of this classic bridge and a tumbling waterfall. Should you choose to dine in the restaurant, try to get a table overlooking the falls if possible. In Woodstock, we saw a sign for used books and had to stop. We both love books, but Nathan is a bookstore fiend. The shop was a great little find. When searching for what to do in Woodstock, don’t discount those hidden gems that you just might stumble across. 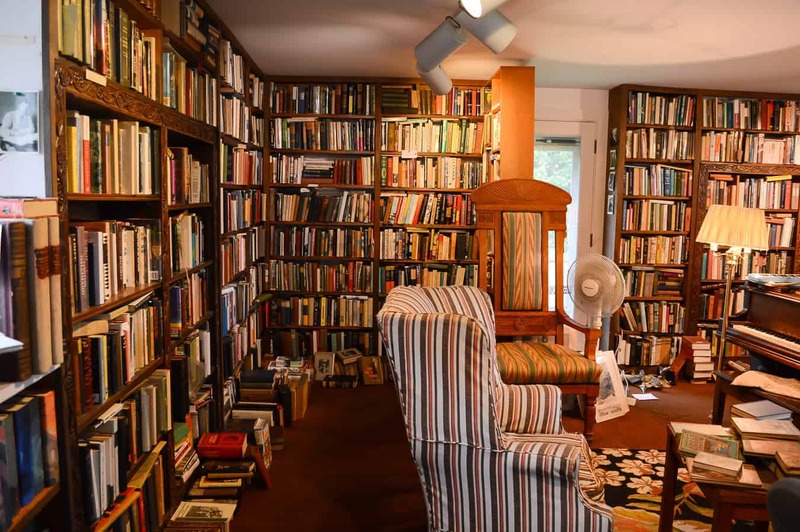 This eclectic bookstore had lots of volumes old and new and was a fun place to browse. They also had a nice view over the river from behind the shop. Of course, after a day spent adventuring around Woodstock, you’ll want a wonderful spot to rest your head. There are plenty of hotels in Woodstock Vermont to choose from. We have a couple of recommendations, depending on what you’re looking for. On a honeymoon in Woodstock, or celebrating a super special occasion? 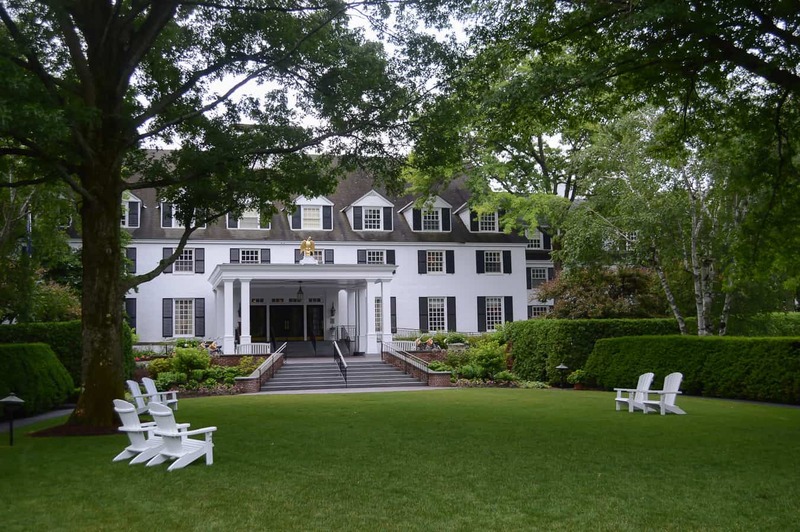 You might want to stay in the Woodstock Inn, an exquisite property that hosts beautiful weddings. 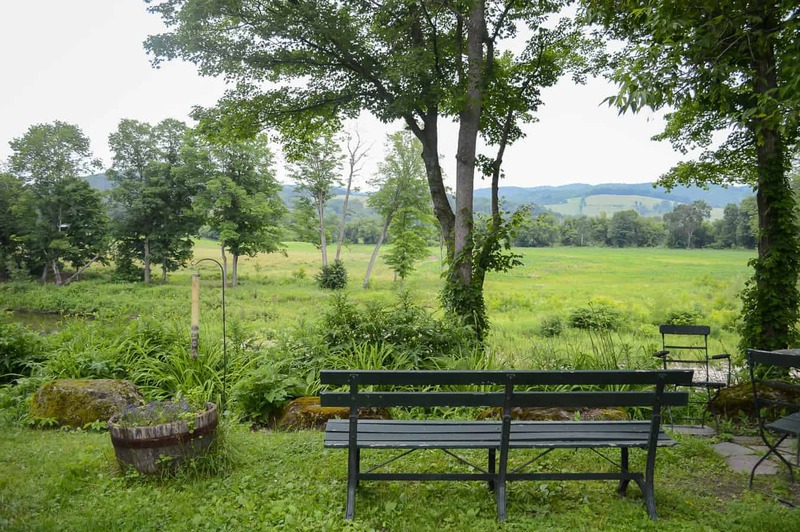 This is definitely more of a splurge property, but is a good option for a romantic getaway in Woodstock VT. Click here to check latest prices & availability. Another Woodstock accommodation you might choose is The Jackson House Inn. For those seeking a classic Vermont bed & breakfast experience, this is a terrific choice. The inn is located a few miles from downtown Woodstock, providing a more country feel. Click here to check prices & availability. Yet for the budget conscious, there can be no better choice than the Sleep Woodstock Motel. In fact, this is an all-around excellent option for Woodstock VT lodging. The prices are right, but the motel feels a bit upscale. Sleep Woodstock is a newer addition to the Woodstock area, and a good one, too, as this is a region that doesn’t have too many budget-friendly accommodation choices. 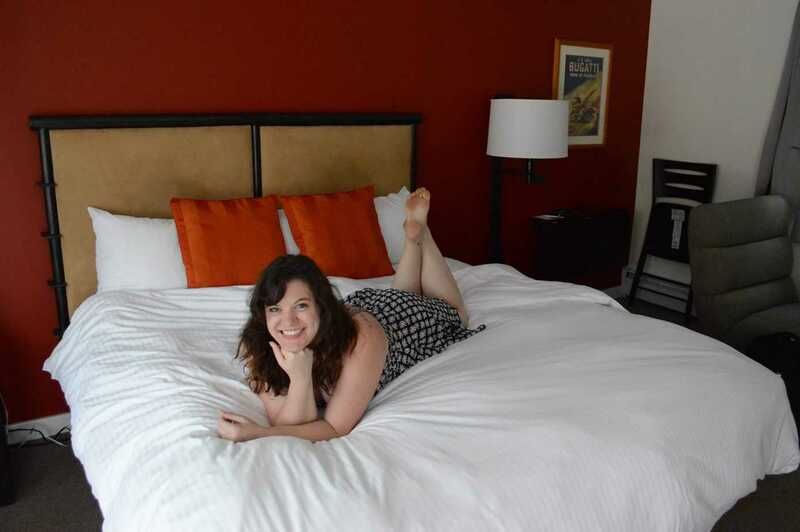 Clean, cute, and homey, the Sleep Woodstock has the vibe of a 1950s motor lodge combined with the touches of a modern hotel. 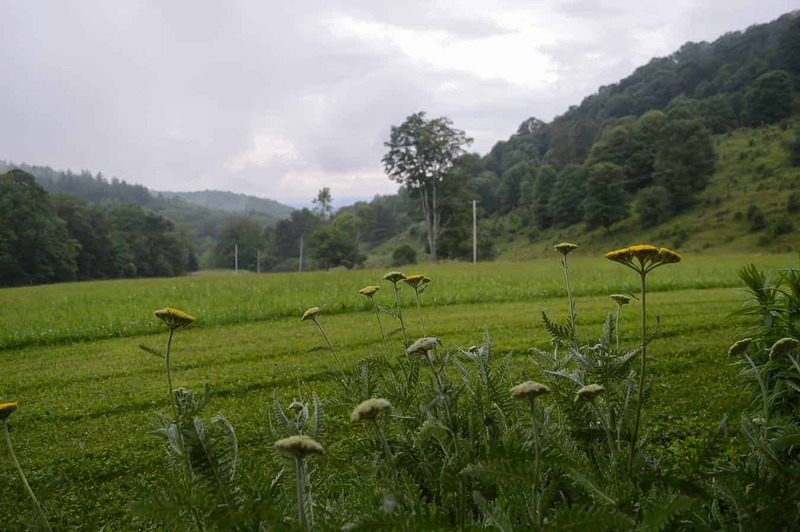 We were hosted here during our recent Woodstock stay, and we really, really loved it. The room was spacious, every feature brand new, and the bed provided one of the most comfortable nights of sleep ever! Our room had a fridge and microwave, too: very convenient for chilling our wine. To top it off, owner Patrick is super friendly and ready to give you tons of suggestions on things to do around Woodstock, especially where to grab the best food. 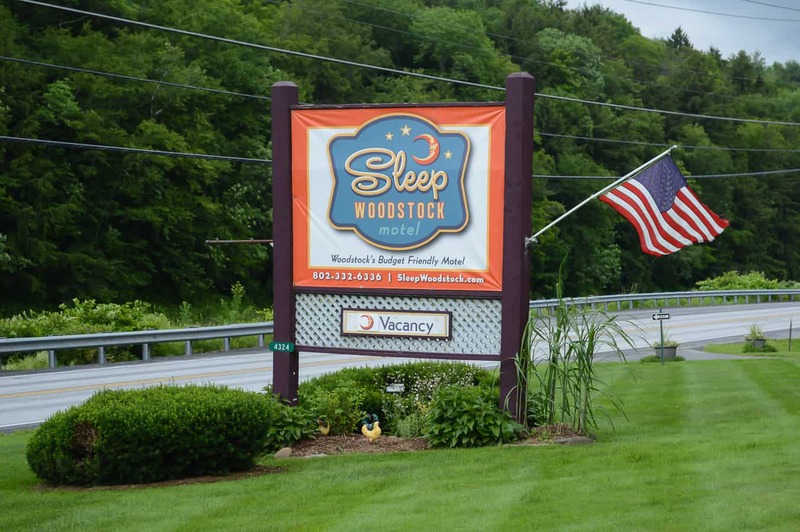 We absolutely recommend Sleep Woodstock for couples, families, and other travelers. It’s an affordable motel in Woodstock VT in a great location. Click here to check prices & availability. We were a bit disappointed during our visit to the region because we caught a few very rainy days. Had the weather been a bit finer, we would definitely have taken in some of the nice hiking near Woodstock VT.
Mount Tom seems to be the #1 choice for a short yet very scenic hike. This peak will reward you with views over the town of Woodstock. Want to get out and about for some hiking in the area? This resource for local hiking trails will tell you all you need to know. Covered bridges? Check! Stately Vermont homes? Check! White, steepled churches? Check check check! 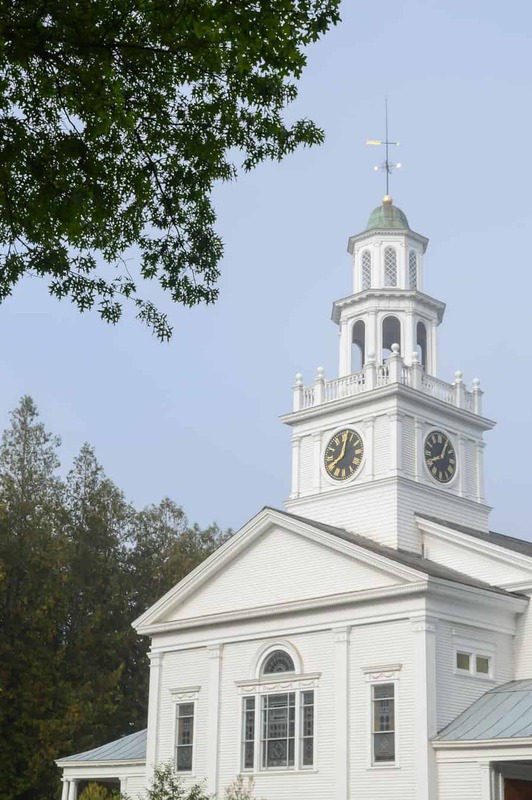 There’s no shortage of this classic New England architecture in Woodstock. A walk around downtown Woodstock will introduce you to much of this quintessential architecture, but don’t just stick to the main road. Venture off into the nearby residential areas. The stately homes are beautiful, and during our visit in July, are often draped with red white and blue banners and flying many American flags. Classic New England at its finest! And of course, Vermont is famous for its covered bridges. There are 100 spread out over the state and quite a fair few to be found from Rutland to Woodstock and surrounds. Ready to travel to Woodstock Vermont? Here are all the things you need to know. Woodstock is located in the eastern central part of the state, close to the border with New Hampshire. It is most accessible via car. Closest airports to Woodstock VT include Burlington, VT, Manchester, NH, and Boston, MA. Woodstock is approximately 2.5 hours from Boston. The drive from Burlington VT to Woodstock VT is just an hour and a half. 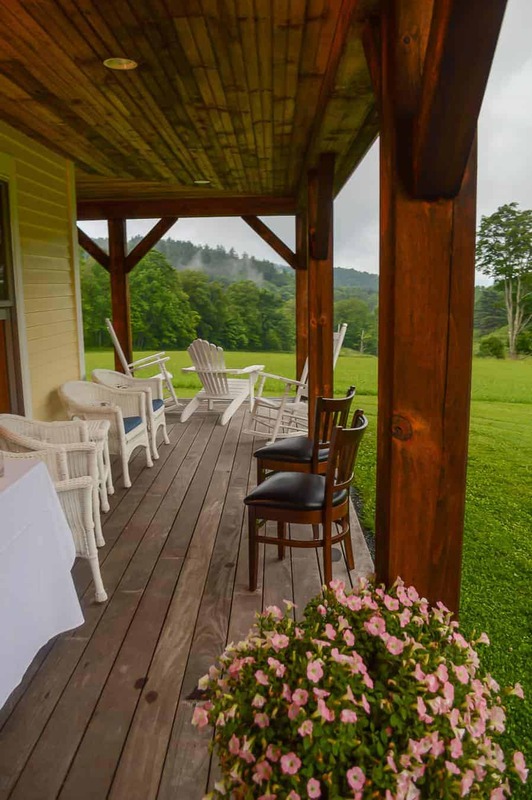 See above for our recommendations on top hotels near Woodstock VT. 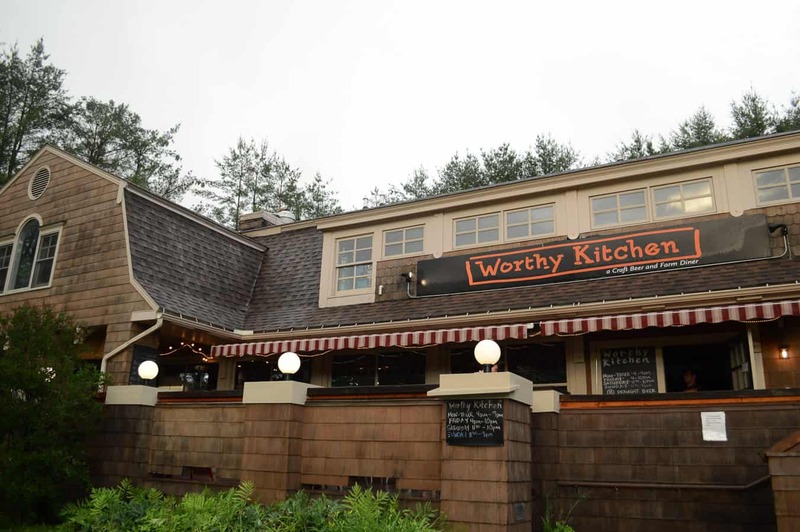 There are a huge number of restaurants in Woodstock VT that beckon you to try them. Unfortunately, you’ll never get to them all in a single visit. As you may know, we really love coffee! Mon Vert has excellent coffee options in a hip downtown cafe. But it’s their breakfast that keeps guests coming again and again. Wow! We dined on fruit-topped french toast and classic biscuits and gravy. We were stuffed to the gills after our meal, but so, so content. Like Cloudland, Mon Vert Cafe also relies heavily on local farms and suppliers. No doubt, this is one of the reasons the food is so awesome. Though Mon Vert would be our pick for best coffee in Woodstock, Soulfully Good also boasts some nice options, including a tasty maple latte. But they have great sandwiches which make for a perfect quick lunch. 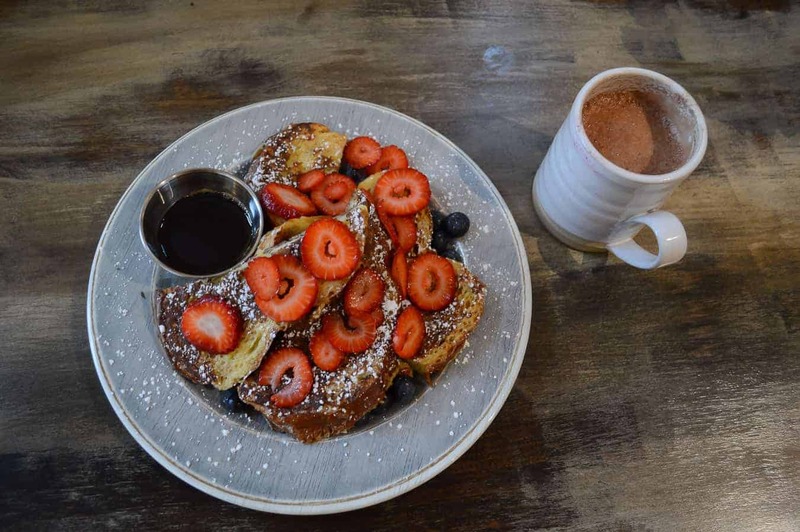 And as one of the downtown Woodstock restaurants, you can grab a bite and then get right back to your shopping. Nathan enjoyed the ham and cheese panini. Another of the best restaurants Woodstock VT offers is a bit east of downtown. In an unassuming brown building, you’ll find the delicious Worthy Kitchen, a super casual eatery that is really crowded—and with good reason. This place is deeeelish. We ate a Saturday night meal here and had a tough time choosing what to order. Eventually, Nathan opted for a brisket sandwich, and I went classic – a cheeseburger. Both were excellent and served with good fries, too. Don’t miss the nice local beer menu, either. Questions about things to do, where to stay, or places to eat in Woodstock VT? We’re happy to help! Our visit to Woodstock was hosted courtesy of Woodstock, VT (GoWoodstockVT). As always, opinions are our own and reflect our true experience. 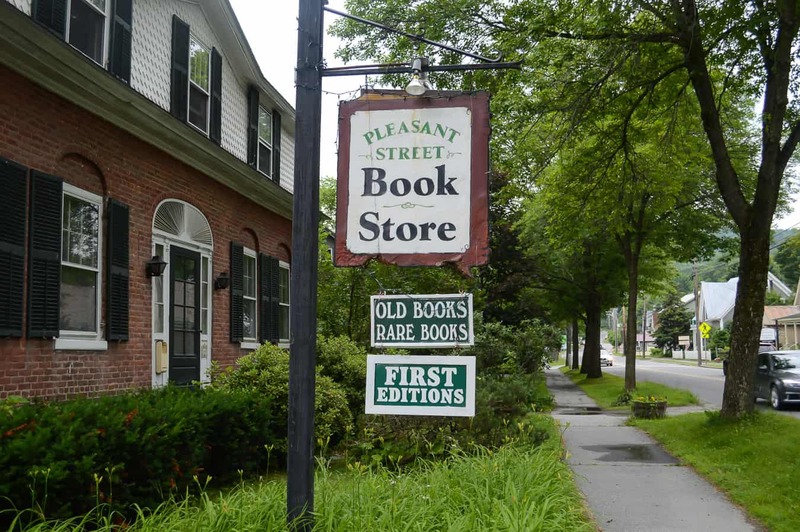 Planning a trip to Woodstock VT? Pin these for later! Omg, how cute is this place!? We used to have a house in Quechee that we’d visit during the winters when I was little. We sold it long ago but I’d love to go back and visit. I have such wonderful memories of that area. Also, CHEESE, so, sold! I’ve always wanted to visit Vermont in the fall. Autumn colors, wood fires, long walks in search of covered bridges, cozy inns with romantic dining rooms…sounds like heaven to me. Did somebody say cheese?! 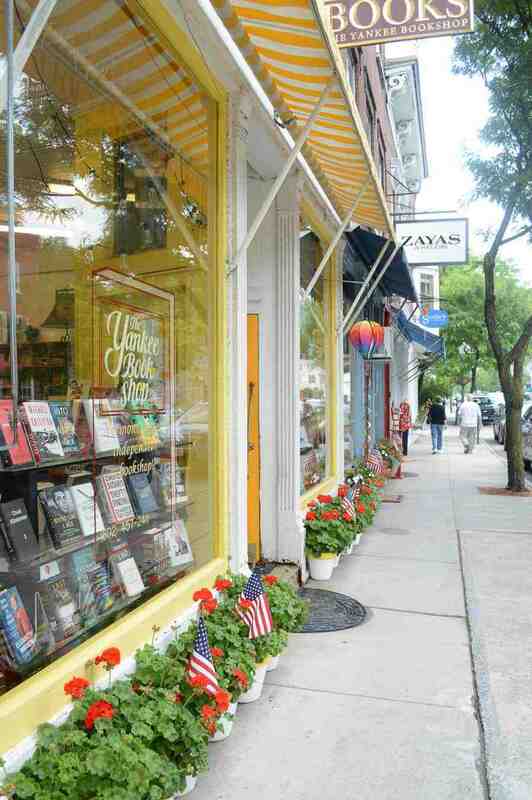 I live in Boston and I’m always looking for cute places to check out up here in New England – thanks for this! We loved visiting Vermont, but we were there in winter which made strolling around a bit of challenge as it was January and freezing cold! But these are awesome tips, I really wish we’d been able to check out Quechee Gorge, it looks lovely! Love the look of Woodstock, it looks really charming and very geared up to visitors. As a cheese addict, I’m totally about the cheese and my other half would love to visit the local brewery. Could happily spend a few days pottering around this area! I have heard about Woodstock festival, but didnt realize the city was such a beautiful place! I love the scenery. It looks so American. What a cute place! Love the covered bridge and the cute shops! The maple syrup is the cherry on top! Haha absolutely!! Syrup is life. Looks like a very beautiful place and I love the covered bridge. I have been to Vermont only twice, and I agree, it is charming America. The covered bridges, maple syrup, and quaint country feel. I hadn’t thought about Woodstock before, but through your eyes it is lovely. While everything about it looks inviting, just that waterfall with the covered bridge would be enough to get me to want to visit. Just started eating cheese so this place sounds good to me! I also love archetecture so seeing different styles of buildings is another attraction for myself! Nice read! I’ve only traveled through Vermont so it is high on my bucket list. (trying to get all 50 states in before turning 50). What a lovely guide of things to do. Between the cute downtown, cheeses, book shop, yummy food, and working dairy farm (I LOVE COWS! ), I would be quite a happy camper. Great accommodations, too! Woodstock looks so lush! And I’m quite interested with all that maple syrup goodness! Would definitely like to check out your recommendations especially the food, and the book shop! maple syrup rocks!! Have you been to VT before? 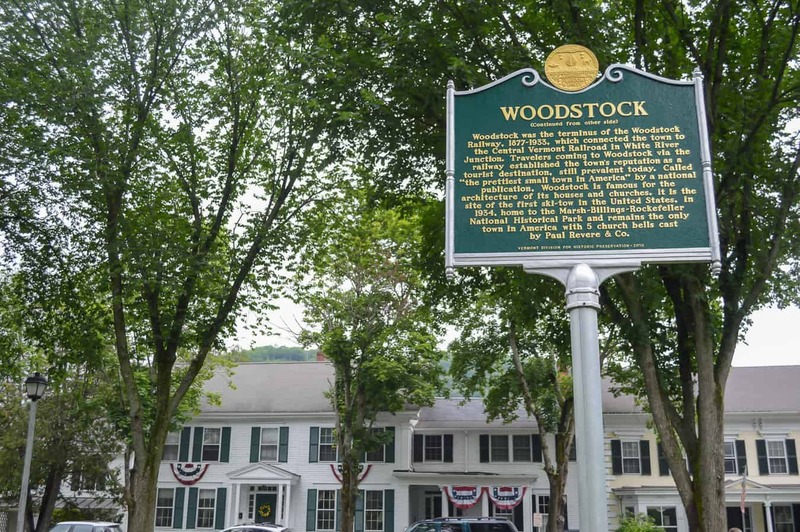 I love the diversity of things to do here, Woodstock sounds like a wonderful place to vacation! 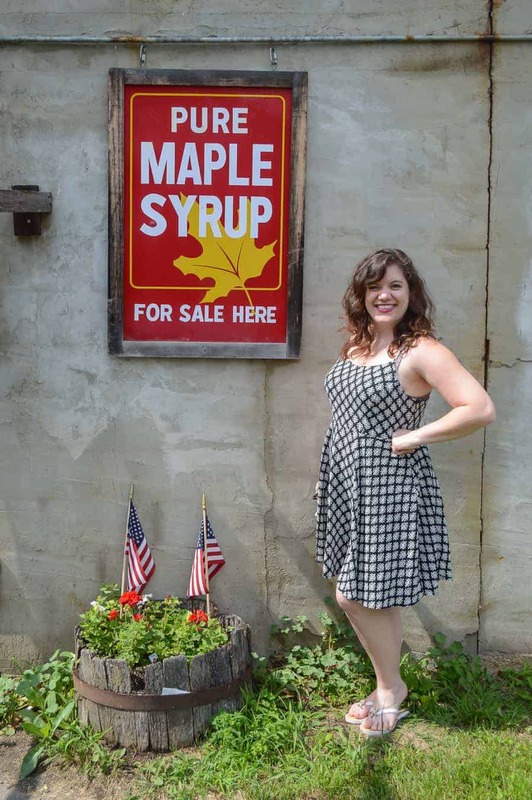 I’ve developed a love of cheese recently, so Sugarbush Farm would definitely be on the list, and let’s be honest, who would say no to a maple syrup tasting right! Looks like a really charming town to (as you said) just walk around too – I love dropping into antique & book shops and discovering local eateries and hidden gems. 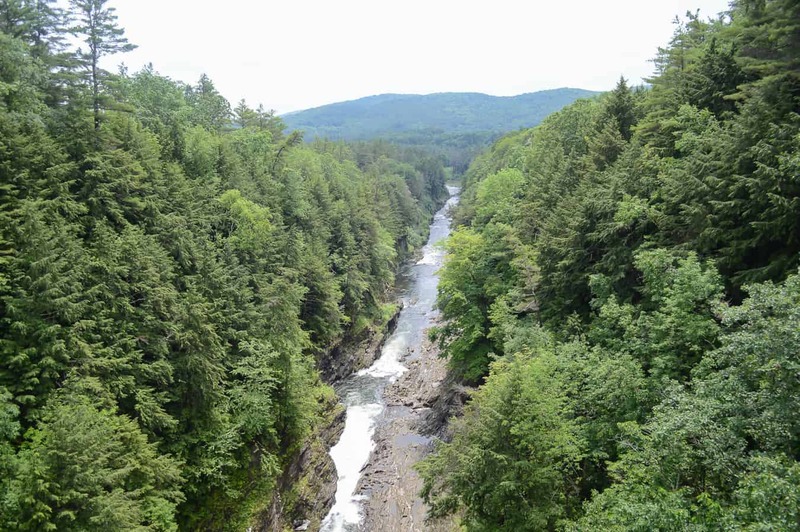 Love that there’s access to nature too – Quechee Gorge looks beautiful. Thanks for introducing me to Woodstock! I was so glad to come across your website. Very helpful! Would you say there is enough to keep busy for 4 full days? and if we were to stay at the Woodstock inn, is there a beach nearby where we could spend the day? sorry, my 2 sons are laughing at me because I asked you about a beach, my geography obviously isn’t up to par! I was hoping for a beach vacation, and someone mentioned Woodstock in general……thanks! Thank you for this wonderfully detailed post! Ive passed through the area before and have stopped at some of your recommendations and all were excellent (Mon Vert, Worthy Kitchen and Long Trail). I am finally going to Woodstock for a proper visit in a few weeks and have saved several of these for the itinerary! Thanks again!! Fantastic! We’d love the chance to go back again. It’s such a perfect Vermonty area. Have a good visit!